The CEO of blockchain firm Digital Asset has requested to step down for personal reasons. 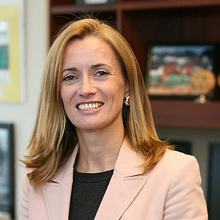 Blythe Masters, a familiar face on the fintech conference circuit, had previously worked at JP Morgan for 16 years. With that kind of background, and her attitude and energy, she was generally seen as a positive image for blockchain. Of course, that quote is useless and tells us absolutely nothing about why she’s leaving. You could argue her timing is good because in the related world of Bitcoin, its price sank below $4,000 in November for a while. Today (20 December), it’s at $4,150. Some people reckon that the bubble has burst. Although folks have been saying that kind of thing for years. There is also the matter of the Australian Stock Exchange (ASX). As reported in September, it pushed back the go-live of its blockchain system to between Q4 2020 and Q4 2021. In partnership with Digital Asset, which is providing the technology, it was said to be the “world’s first” securities exchange to adopt the technology as part of its core services. The idea was to replace its current system, Chess (clearing house electronic sub-register system). It will now be used in parallel… if it ever goes live. However, when all this is said and done, Masters will remain involved in the company as a board member, strategic advisor and shareholder. Gangadhar, who joined the company’s board of directors in April, has been appointed the board chairman and will serve as the acting CEO until a permanent CEO is named. Founded in 2014, the company has nearly 200 employees. It says it has clients from New York, London, Budapest, Zurich, Hong Kong and Sydney. Back in July, Google Cloud said it will use Digital Asset’s blockchain platform and developer tools for its own platform.